Medieval. Medieval. Medieval. Everywhere we go we are surrounded by very old stuff. I love it. It makes me happy. I’ve dragged my husband and the girls all over the southwest region of France in order to soak in these small pearls of art and architecture and there’s still so much more to see! I am driving them nuts, but it’s worth the insanity to see these beautiful sights. In order to keep them motivated, we’ve made it a tradition to seek out the best ice cream in each town. The weather has been sunny and hot. And ice cream is the perfect afternoon remedy for cranky and sweaty kids and parents. Chloe has become spoiled. She will stomp away in disappointment and disgust if the ice cream on offer is made by a conglomerate like Nestlé. The only ice cream that passes muster for her after two weeks in France is the kind that is labeled “artisanal.” It has to be made locally and using the finest ingredients. Over the last few days, we have visited several medieval towns and have successfully found delicious ice cream in most of them. 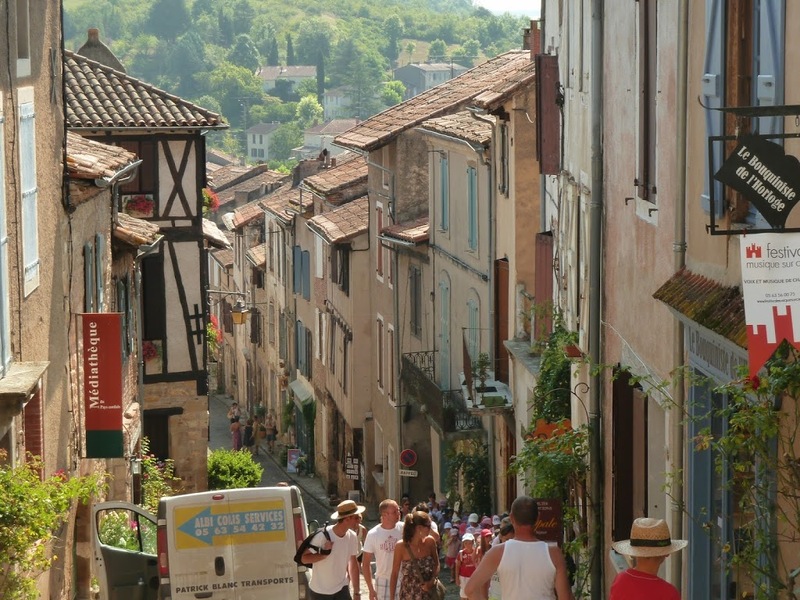 In Cordes-sur-Ciel, I climbed a steep hill (the girls and their Papa took the tourist tram) that rewarded me for my efforts with a scene out of a fairy tale. The town was saved from destruction in the 19th century by artists and artisans who were determined to preserve the medieval buildings for posterity – and thanks to their efforts, Cordes has one of the largest concentrations of original medieval architecture in France. After Cordes, we took a drive to Albi, most famous for being the home of Toulouse-Lautrec. I like to think of Albi as the city of Toulouse’s baby sister, for like Toulouse, its architecture is resoundingly brick. To escape from the heat we visited the Toulouse-Lautrec Museum, which is housed in a beautiful medieval castle. Sophie enjoyed looking at the works of art and finding the answers to the questions in her special activity booklet; Chloe didn’t like his style at all and was ready to leave just as soon as we arrived. As far as Chloe was concerned, Albi had an additional strike against it because we were unable to find acceptable ice cream there. We said good-bye to Toulouse today after a lovely stay with our cousins. 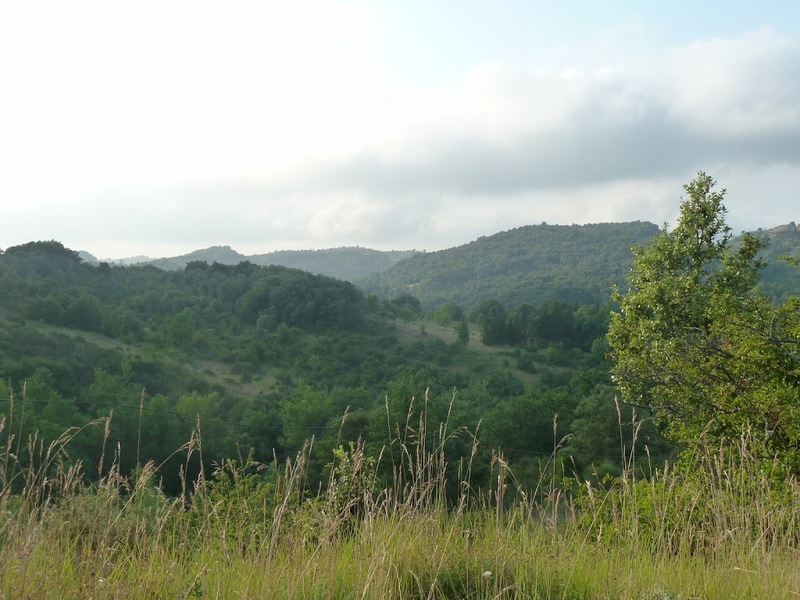 We leisurely made our way to our next stop in the region of Languedoc-Roussillon. 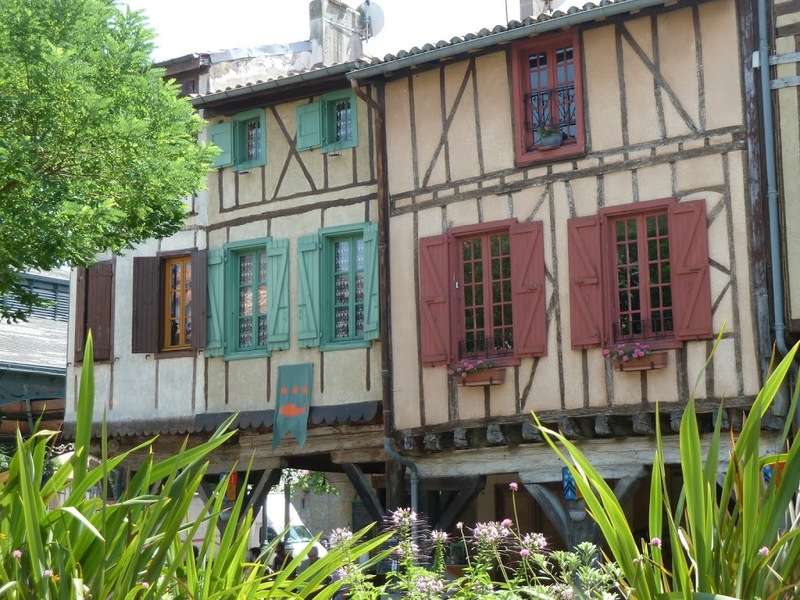 On the way, we took a tour of the Airbus factory (that new A380 plane is f**king huge) and stopped for – you guessed it – ice cream, in the tiny, but ever-so-charming, medieval town of Mirepoix. This time, we hit the jackpot. Locally made, we savored violet-flavored and wild berry-flavored frozen treats. Our home for the next week is in Fajac-en-Val, a needle-in-the-haystack village a few miles outside of Carcassonne. Carcassonne is the medieval fortress city to beat all medieval fortress cities. I have not told Sophie that I intend to spend time there, as she will yell at me for making her go to yet another old town. 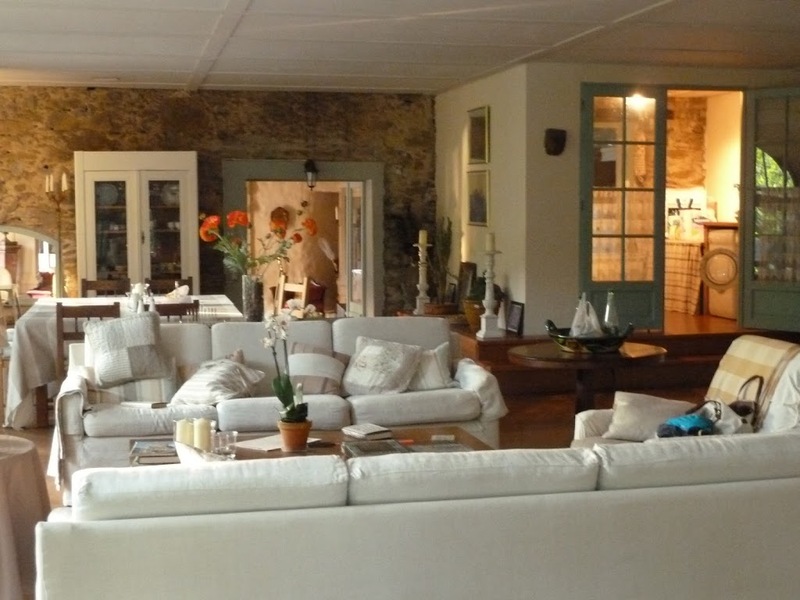 The house we’ve rented with my husband’s family is a gem in the middle of Cathar country. The Cathars were members of a Christian sect that was active from the 12th-14th centuries and renounced the teachings of the Catholic Church. I’ll have more to say about them in a future blog post. But the region we’re now in is chock-full of ruins from that time and also chock-full of crazy stories and conspiracy theories about the Cathars and other mystical groups – like the Knights Templar – that roamed these hills centuries ago. Back to the house. After leaving Carcassonne and traveling about eight miles up and down an extremely winding one-lane road surrounded by farmland, you suddenly arrive in Fajac, a hamlet that boasts a tiny medieval church, about 50 inhabitants and the beautifully restored 13th-century farmhouse that is ours for the next seven days. Below is the endless view of green from the road near the house. 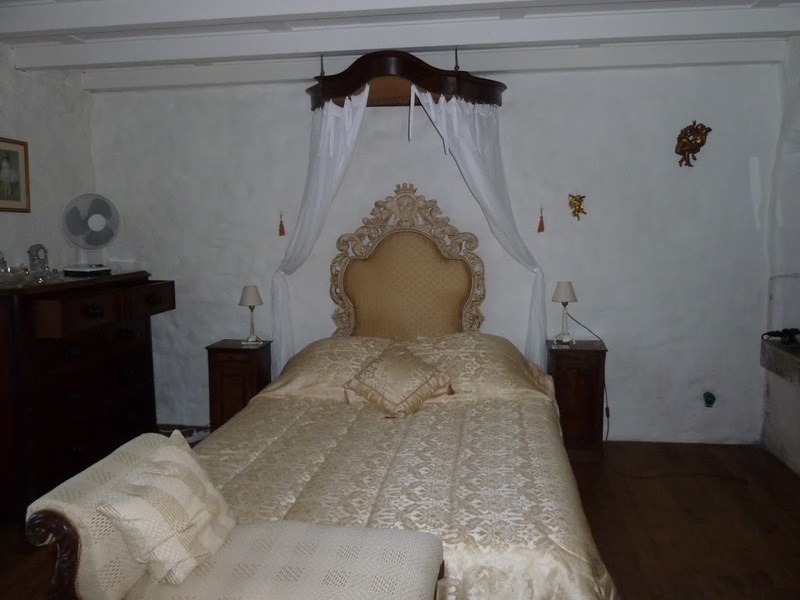 And below are photos of the salon and one of the bedrooms in our temporary paradise. When Sophie entered l’Auberge, as it’s called, for the first time this afternoon, she screamed with joy. Hidden passageways, thick stone walls, a swimming pool and a bathroom in every bedroom…what’s not to love? Forget medieval village hunting. I’ll never get her out of here. Period.